Telerik Kendo UI MVP & Evangelist, MSDN Author, MCPD, Hacker, App/Dev Architect, Codementor, Blogger, CoD Gamer, ♥'ing Dad & hooked on TypeScript & MEAN stack! This will be part three of a six part series of blog posts. Update: 09/09/2013 – Project has been uploaded to CodePlex: https://genericunitofworkandrepositories.codeplex.com, updated Visual 2013, Twitter Bootstrap, MVC 5, EF6, Kendo UI Bootstrap theme, project redeployed to Windows Azure Website. 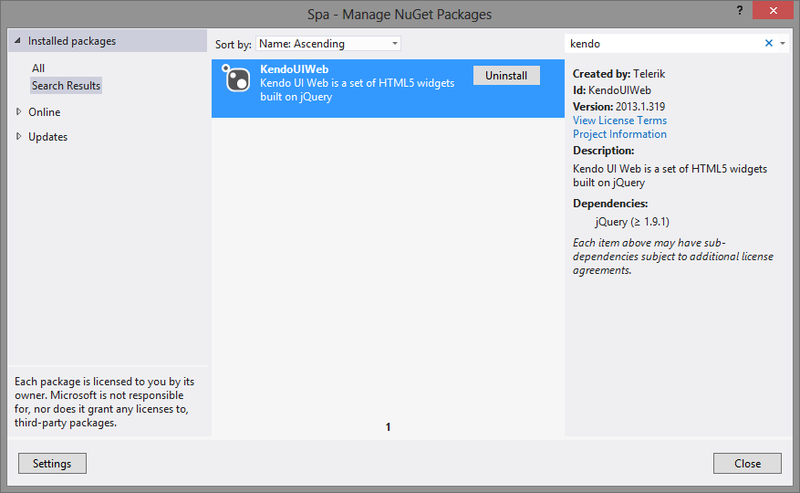 Wondering how to setup a SPA with MVC 4 project using Kendo UI Web…?! Well let’s cut to the chase and get started. We will start off with a plain old regular ASP.NET MVC 4 Internet project template and convert to a SPA, for the most part this implementation will keep in mind many of us are familiar with MVC 4 so we’ll try to adapt a lot things we are intimate with like the usage and organization of views, layouts, conventions, etc. This will be part one five of a five part series of blog posts. 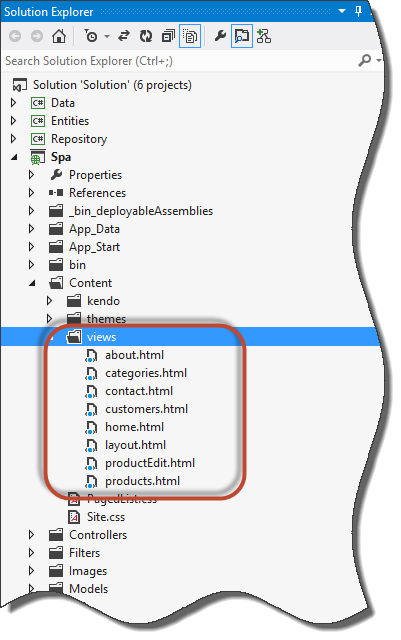 Taking a look at a high level architecture of this three part series blog: Modern Web Application Layered High Level Architecture with SPA, MVC, Web API, EF, Kendo UI. You’ll need KendoUIWeb NuGet package. First let’s create the SPA landing page (index.html), this will be the default page when the site is loaded up and where our Kendo UI Layout object will reside, and where we will swap our different views in. The templateLoader helper method was used from here, and has been slightly modified so that we can load Kendo Views remotely from the server in our SPA when navigating through the application. We are also putting the Kendo UI Router to good use so that we can navigate between the different views in our SPA while syncing with the browser history so even though we are never refreshing, and our app never does any post backs, the user is still able to navigate back and forward using their browser buttons. We can see that we are also using the Kendo FX API, this is to polish the UX in our SPA by adding slide transitions when swapping views. We are simply remotely loading the requested View (if it hasn’t already been loaded for the first time) from the server, sliding the #body div to the left, swapping the View with the requested one, sliding the #body div back it’s place (you can click on the live demo link to see this in action). If the view has already been loaded we cache the view in a dictionary, the next time this View is navigated to, we will check cache it it already exist then will load it from there, if not, we’ll load it from the server. Yes, we could have done the transitions this with a jQuery plug-in or some other tool or framework, however the intent was here was to accomplish this (along with Part 2 and 3 of this blog series) with the use of only framework, Kendo UI Web. The addRoute is simply a helper method to register our routes and the with the Router along with the delegate we want invoke when navigating between our Views. Our delegate simply handles the animation transitions, switching out the Views and caching of our Views. Now our next step is just converting the regular ASP.NET views to pure html which is pretty straight forward. For now, since MVC ignores routes for anything under /Content folder, we’ll just put our views in Spa/Content/views/, you can place them anywhere you see fit, and just have the MVC runtime ignore that path using the routes.IgnoreRoute([path-goes-here]) method in your RoutConfig.cs. <a href="http://asp.net/mvc" title="ASP.NET MVC Website">http://asp.net/mvc</a>. The page features <mark>videos, tutorials, and samples</mark> to help you get the most from ASP.NET MVC. <a href="http://forums.asp.net/1146.aspx/1?MVC" title="ASP.NET MVC Forum">our forums</a>. NuGet makes it easy to install and update free libraries and tools. and price for your applications. Use this area to provide additional information. We see that each and every View is responsible for the Model that it will use and bind to, so every view will need to have a Model. The convention we are using here is name of View and viewModel, e.g. so if your View is name Product then it should have a model named ProductModel. The code in the SPA/Index.html will handle binding them together, we just need to follow the convention and everything else is handled. Learning Kendo UI Web Development with MVC Book Published…! Follow up on one of my previous blog post in regards to Kendo UI Web with MVC book project I had the opportunity to be involved with as a Technical Reviewer, the book is complete and has been published..! Kudos to John Adams (author) from RBA for all the late nights, weekends and hard work I know he put into the project. For those of you looking for a good starting point, incorporating Kendo UI Web into your MVC project or solution the book has some good real world practical implementations with ASP.NET MVC. Personally and professionally Kendo UI Web is my client side framework of choice. It’s one solution that offers it all, so that you don’t have into incorporate and include several different frameworks to gain some of the fundamental features of Kendo UI Web, especially when working with MVC. 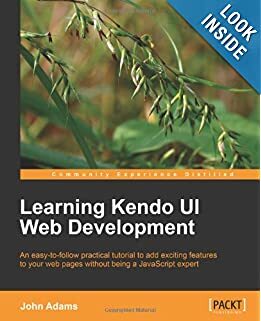 This book will take you on a survey through Kendo UI for the web from the basic widgets that wrap input fields to the full page scaffolding widgets for setting up your site. A practical tutorial with step-by-step example based approach. John Adams currently works as an application development consultant in the Dallas/Fort Worth area for a fantastic company called RBA. He has been developing custom business applications with the Microsoft .NET platform for 6 years and has specialized in development with ASP.NET MVC. He loves writing code and creating solutions. Above all, he loves his wife and children and the lord Jesus Christ. This book is dedicated to Michell, Samuel, and Sophie whose patience with my late nights made this project possible. I would also like to thank RBA, especially my manager Will, who introduced me to the project and kicked everything off. Finally, I would like to thank Kartikey Pandey, Anugya Khurana, Mayur Hule, Ricardo Covo, and Long Le for their oversight and editing skills. Their work has been exceptional and valuable throughout. Ricardo Covo has more than a decade of international experience in the Software Development field, with experience in Latin America, California, and Canada. He has a wealth of experience in delivering data-driven enterprise solutions across various industries. With a Bachelor’s degree in Systems Engineering, complemented with a certification in Advanced Project Management, he has the right combination of technical and leadership skills to build development teams and set them up for efficient execution. In 2007 he founded (and is the principal of) Web Nodes – Software Development (http://webnodes.ca); a custom software development company, with clients big and small in Canada, United States, and South America. Prior to Web Nodes, Ricardo spent some years in the corporate world both in Canada and in the U.S., being part of companies such as Loblaws Inc., Trader Corporation, UNX (http://www.unix.com) and Auctiva (http://www.auctiva.com). Ricardo’s passion for technology goes beyond work; he normally works on personal projects in an effort to always remain on top of the changes in technology. These projects include: http://ytnext.com, http://serversok.com, and http://toystrunk.com. Long Le is a Principle .NET Architect and ALM Practitioner at CBRE. He also serves as consultant for Thinklabs and spends most of his time developing frameworks and application blocks, providing guidance for best practices and patterns, and standardizing the enterprise technology stack. He has been working with Microsoft technologies for over 10 years. Le has focused on a wide spectrum of server-side and web technologies, such as ASP.NET Web Forms, ASP.NET MVC, Windows Workflow, LINQ and Entity Framework, DevExpress, and Kendo UI. In his spare time, he enjoys blogging (http://blog.longle.net) and playing Call of Duty on his XBOX. He’s recently became a proud father of his new born daughter Khloe Le. You can reach and follow him on Twitter @LeLong37. Special thanks to my significant other Tina Le for all your love and support throughout this project and to my wonderful newborn daughter Khloe Le. I love you.